Sources: New York Times, CNN, QZ, candidate websites and facebook pages. BASIC INFO: Booker, who boasts a Twitter following of more than 4 million people, gained national recognition during his tenure as Newark’s mayor, at times answering pleas to shovel residents out after major snowstorms. QUOTE: I believe that we can build a country where no one is forgotten, no one is left behind … where we see the faces of our leaders on television and feel pride, not shame. 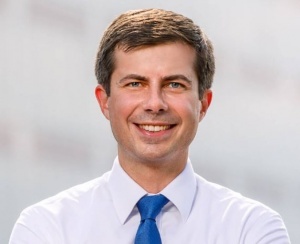 BASIC INFO: Known locally in South Bend, Indiana, as “Mayor Pete,” Buttigieg served as a naval officer in Afghanistan. Buttigieg, though a long shot, would be the youngest and first openly gay president if elected. QUOTE: video, in his own words. BASIC INFO: After growing up in a poor San Antonio neighborhood, Castro—and twin brother Joaquín—went on to earn Ivy League degrees and take on careers in national politics. 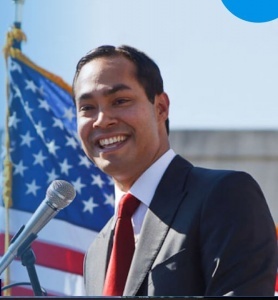 Onetime mayor of San Antonio, Castro was US secretary of housing and urban development under Barack Obama. That experience, along with his mother’s activism with Latino groups, is a central part of the narrative. QUOTE: If we want to see change, we don’t wait for it, we work toward it. Today, more than ever, we must work together to build an America where everyone—no matter who we are or where we come from—can thrive. 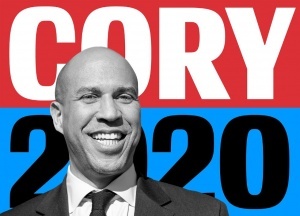 Biggest idea for the economy: Though he hasn’t released many details of his platform, he’s been a strong advocate of free trade, which has benefitted his hometown. He’s defended free trade deals, arguing that instead of scrapping them, they should be reworked to strengthen protections for workers and the environment. BASIC INFO: A self-made businessman, Delaney at one point was the youngest CEO on the New York Stock Exchange. Delaney has been running the longest — he declared his candidacy in July 2017 — but is still working to gain name recognition. QUOTE: For too long, the conversation in politics has been about trying to return to the past instead of focusing on the most important thing — the future. BASIC INFO: Gabbard is the first American Samoan and the first Hindu member of Congress, and brings her experience as an Iraq War veteran to the House Armed Services Committee. QUOTE: When we listen to each other with a clear mind and an open heart, we will heal the divide and build a majority coalition around our common values of service above self, freedom, justice, love for country, prosperity and peace. BASIC INFO: Gillibrand campaigned as a child with her grandmother Dorthea Noonan, a longtime president of the Albany Democratic Women’s Club. The New York Democrat called for former Sen. Al Franken to resign and has acknowledged her increasingly progressive stances on immigration and gun reform running counter to previous positions she held running for the House. BASIC INFO: Harris is the daughter of Jamaican and Indian immigrants and grew up attending both a Baptist church and a Hindu temple. 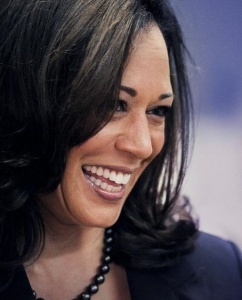 Kamala Harris became a prosecutor in Oakland, the San Francisco District Attorney, and California’s Attorney General before winning her US Senate seat in California. BASIC INFO: As the head of Colorado from 2011 to 2019, Hickenlooper helped steer the state through several tragedies, including the 2012 shooting in a movie theater in Aurora that left 12 people dead and catastrophic wildfires and floods in 2013. Before his two terms as governor, he served as Denver’s mayor for eight years, after opening a large brewpub there in 1988 that went on to help reinvigorate the LoDo area of Denver. BASIC INFO: Inslee, who has held elected office for much of the last three decades, has been an outspoken progressive executive since he became governor in 2013. He has been a vocal opponent of President Donald Trump, including suing the President after he tried to ban immigration from several Muslim-majority countries. Now, Inslee is running as the climate change candidate. We are the first generation to feel the sting of climate change and the last who can do something about it. As president, Governor Inslee will build a new economy based on clean energy and justice. QUOTE: We are the first generation to feel the sting of climate change and the last who can do something about it. As president, I will build a new economy based on clean energy and justice. 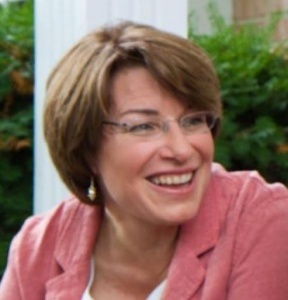 BASIC INFO: Klobuchar announced her run outdoors as it snowed, which she tied to her commitment to a “homegrown” campaign with “grit.” The Minnesota moderate is looking to work across the aisle and win back fellow working class midwesterners. 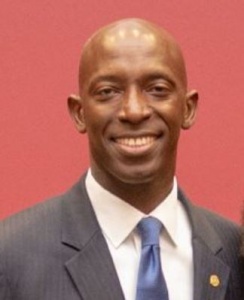 BASIC INFO: Mayor of Miramar, Fla., former college football champion. Has taken progressive stances on guns, immigration and environmental issues. Has proposed canceling the more than $1.5 trillion in student debt owed by 44 million Americans. QUOTE: The gun violence epidemic continues to take far too many lives, climate change damages more homes and devastates more communities each year, skyrocketing healthcare costs cut off many Americans from the possibility of their American Dream, and crippling student loan debt leaves people of all ages with little hope for the future. These big issues need fresh eyes and bold ideas from someone closer to the people, so our voice can be heard. Together, we can fundamentally change our country for the better and tackle these challenges with actions that match the scale and urgency of this moment. QUOTE: The challenges we face are the greatest in living memory. We can only meet them if we build a movement that includes all of us. Youngstown and Akron, that traditionally votes Democratic but swung to Trump, and he’d have supporters there. QUOTE: As a congressman from Youngstown, Ohio for almost 20 years, I’ve watched the American Dream slip through the fingers of many Americans. It’s time for us to start building the America we deserve. An America that invests in public education, affordable health care and an economy that works for all of us. An America united by a shared vision for our future. 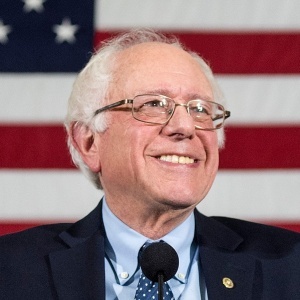 BASIC INFO: Sanders’ democratic socialist platform gained significant traction during the 2016 primaries, when the independent senator who caucuses with Democrats ran against Hillary Clinton. 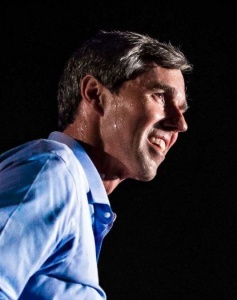 His policy agenda includes various progressive proposals, many of which have been embraced by the Democratic Party, like expanding health care, broadening the social safety net and making higher education free. QUOTE: Change never takes place from the top down, it comes from the bottom up. Because millions of people came together to fight for change, ideas that were considered radical a few years ago are mainstream today. And if we stand together, we can turn those ideas into reality. BASIC INFO: Has a growing national profile, thanks to his popularity as a cable news guest. 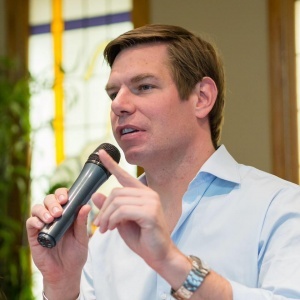 Has stressed his experience as a prosecutor to investigate the Trump administration; proposed funding for innovation in medical research; pushed for a national ban on assault weapons. As a member of the House Judiciary and Intelligence Committees, could have a high-profile presence on issues like impeachment and the Russia investigation. QUOTE: For the last six years, I’ve represented California’s 15th Congressional District, including much of the eastern San Francisco Bay Area. I was born in Iowa and spent my early years in Algona, where my dad served as police chief, before our family moved around and eventually settled in Dublin, California. Video, in his own words. 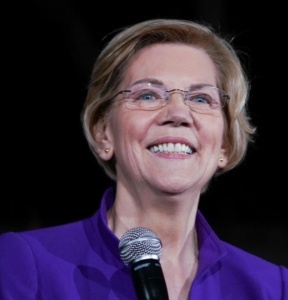 BASIC INFO: Warren was appointed as assistant to President Barack Obama and special adviser to the Treasury secretary in order to launch the Consumer Financial Protection Bureau. She was also appointed to a congressional oversight panel overseeing the $700 billion Trouble Assets Relief Program that was passed in response to the 2008 financial crisis. Currently the senior senator from Massachusetts. QUOTE: This is the fight of our lives. The fight to build an America that works for everyone, not just the wealthy and the well-connected. It won’t be easy. But united by our values, we can make big, structural change. We can raise our voices together until this fight is won. Video, in her own words. BASIC INFO: Williamson is best known for being a spiritual counselor to Oprah Winfrey and has written several best-selling books, including her debut “A Return to Love.” She is calling for “a moral and spiritual awakening in the country” with her campaign. 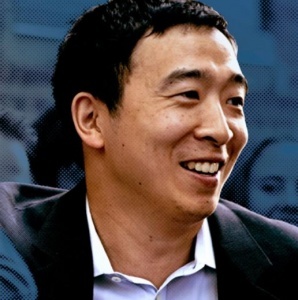 BASIC INFO: Yang is an entrepreneur who launched Venture for America, a fellowship program that aims to connect recent grads with startups. Yang entered the race Nov. 6, 2018 on essentially a single issue: protecting Americans from job-stealing robots. The son of Taiwanese immigrants, he sells himself as the opposite of Trump—an ego-free Asian man who likes math. He wants to give all Americans a universal basic income of $1,000 per month to address economic inequality. QUOTE: I’m running because I fear for the future of our country. New technologies – robots, software, artificial intelligence – have already destroyed more than 4 million US jobs, and in the next 5-10 years, they will eliminate millions more. A third of all American workers are at risk of permanent unemployment. And this time, the jobs will not come back. I’m an entrepreneur who understands the economy. It’s clear to me, and to many of the nation’s best job creators, that we need to make an unprecedented change, and we need to make it now. As president, my first priority will be to implement Universal Basic Income for every American adult over the age of 18: $1,000 a month, no strings attached, paid for by a new tax on the companies benefiting most from automation. UBI is just the beginning. A crisis is underway—we have to work together to stop it, or risk losing the heart of our country.